So, here I am – rocking up to my blog space like a long lost acquaintance. No apologies or guilt – that’s just boring and unnecessary. But the truth is, last year I embarked on a huge project* (a little more on that later) that just took up a HUGE amount of time and energy and writing. Oh the time spent writing! I love writing, I really do. But this project had me writing to such an extent that I just did not have the brain space left to write anywhere else. So now that the grand project is done (or the creation of it is done, now the actual project is ongoing), I am back here again, ready to revisit my neglected blog, make friends with it again and visit it more often. One thing that has held me back in just getting back to writing here is the feeling that I need to sum up the last year and a bit, and so much time has gone by it just is not possible to write a short summary, so I am just going to look forward and start from here. I hope you don’t mind. Actually, I will go back, just a wee bit to write about something I gifted myself towards the end of last year in October/November. I was feeling rather run-down, perhaps even a little burnt out from the long project and fitting all other aspects of life and creativity into 2018. So, come October I decided I needed to do something a little self-indulgent but creative at the same time. I took myself off for a weekend sketching, staying in a small cottage only perhaps a 40-minute drive from home. There are so many incredibly inspiring places around where I live – I could have easily just gone out sketching for a day and come home again. However, it is all too easy to say ‘maybe tomorrow’ and then attend to other things on the list of things that ‘must be done’. Going away from home just cemented the fact that this was a gift to myself and something to prioritise above all else. I am pretty good at making time for my art but to make time for my art and make it a real treat – well there is something to be said for that don’t you think? Luckily our Autumn days are often cold but bright and sunny. So I packed up a few sketchbooks, simple drawing materials, a flask, layers of clothes, a good book for the evenings and a clear focus that this was about gathering inspiration rather than coming back home with finished work. 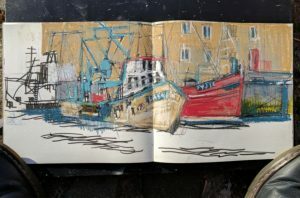 I visited Eyemouth the first day and watched the dozens of divers going out on boats and the fishing vessels sailing in. It was absolute bliss. 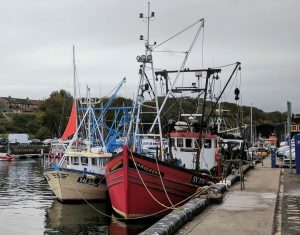 It is a busy working harbour with lots going on. It’s so funny as I have been drawn to represent harbours in my work for a number of years now but they don’t always feature boats. I am usually more drawn to the shapes of the harbour walls, the representation of the edge between land and sea. Boats in my recent more expressive paintings are usually ‘out there’ on the open sea. I have never thought to wonder why that might be, but with a bustling harbour full of boats, on this occasion that is what I sketched. I worked in colour too. My usual preference for sketching en plein air is to work in pencil or carbon pencil in monochrome – but here I had brought my oil pastels and they were great for building up layers of shape and colour. 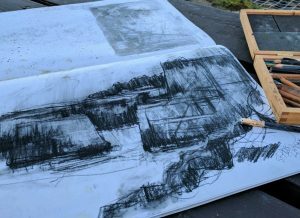 I also worked in an accordion sketchbook – creating simple lines and shapes on page after page in carbon pencil, ready to work into back in the cottage in the evenings. Seeking to simplify what I was seeing so that I could work with memory later on to create colour and texture. 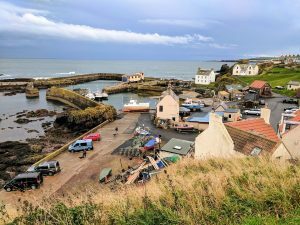 As much as I love Eyemouth, I took myself off to the smaller and more quaint harbour village of St Abbs for the rest of my trip. 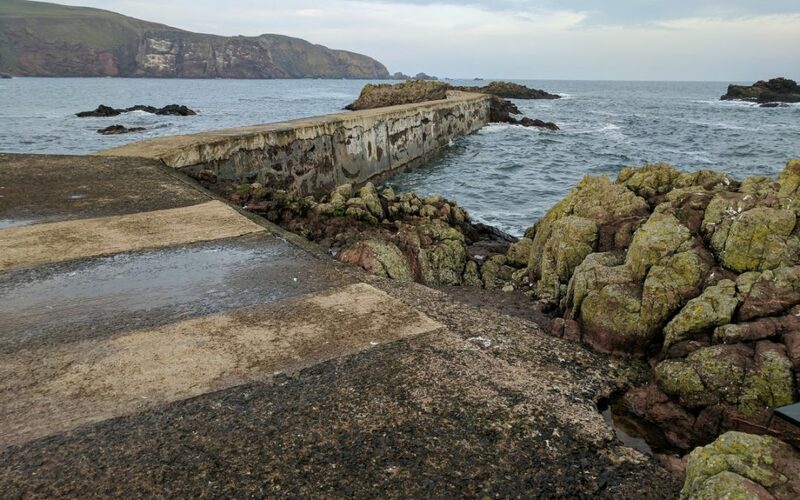 St Abbs is much quieter, particularly on these winter days. I stayed for hours until the sun went down, adding more and more layers of clothing as I grew colder from standing in the same spot. I had forgotten my charcoal pencils but wanted to get back to monochrome expressive marks and lines. There are always broken tips of pencils in my case and it is surprising how much of a drawing you can create with only a tiny fragment measuring but a few millimetres in length! I worked with what I could find until there was only dust remaining. 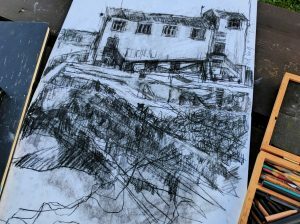 I sketched whilst sat on the cold hard ground, I stood for hours looking at and drawing the rocks out to sea and indulged in a more comfortable sketching spot at the picnic tables looking over to the Lifeboat House. I don’t think I am happier than when I am outside drawing. There is something so peaceful and mindful about looking, watching and recording that moment in time. 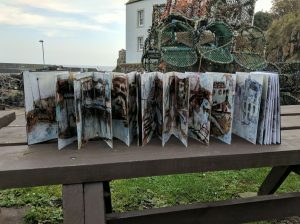 I worked in four separate sketchbooks over the three days and whilst I know I will use them for inspiration in current and future work, for me the time spent is all about being in the moment. Taking that time to focus, leave other work, social media, the diary, the to-do list, the daily life distractions – leave them all behind and just be. As cliche as it might sound, I think this is key to my practice and why I choose to create. I realise how vital it is to my work. I also realise how easy it can be to put this to the bottom of the list. In this realisation, as soon as I returned home, I booked another trip for two weeks later – making the most of the cold but sunny weather before winter set in and the end of the year. 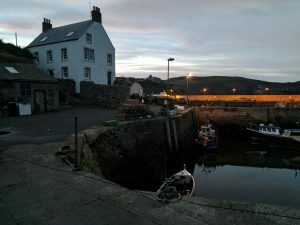 Back to St Abbs, staying in a tiny cottage right on the harbour for three days towards the middle of November. I spent the whole time out sketching from morning till past dark. Sketching when you can’t really see what you are drawing is an interesting exercise but I wanted to stay out as long as I could! I wandered around the harbour with not another soul to be seen and then I sat in the tiny kitchen working in my accordion sketchbooks into the late evening. I filled my sketchbooks with pencil, carbon pencil and oil pastel drawings and worked with inks and acrylics in my accordion sketchbook. I don’t think I could ever grow tired of small harbour places such as this. As I write this, I am about to book another weekend for the Spring. It sounds indulgent somehow. But rather than an indulgence, I think it is important for me to see it as an integral part of my work. Something that I will do at least a few times a year alongside the days I go out sketching in my local area. I think it is a way of honouring what is important in my work. It is my way of valuing what I do and how I do it. It puts time and place and inspiration and reflection at the heart of my practice. It takes me away from daily distractions and to-do lists and connects me to the land and sea. It gets me away from the computer and out of the studio and to places where I feel most alive and connected. *The large project from 2018 – My mentorship programme – Building a Body of Work – had its first run last year and I have just begun with a new group of fabulous artists for 2019. 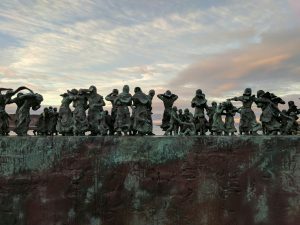 I will write about it more in a future post but if you would like to read more about it you can find more on my Art School Site – Building a Body of Work. I will be running this programme again in 2020 – if you would like more information then you can sign up for more information at my art school website. Thank you Jodi! Yep – I think it is something we all need to make time for – as challenging as that can be. Always love reading your thoughts about what inspires you! Thank you so much Sharyle! Thank you for sharing! Your sketches are very inspiring. 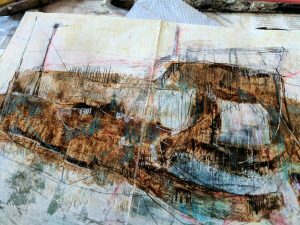 I am intrigued by your use of oil pastel in the sketchbooks – I was taught that oil pastels cannot be used in sketchbooks because the oil would ‘sink’ into the paper (to the back)… Would you mind sharing about your materials/technique? E.g. do you use pastel or watercolour paper, or perhaps gesso first? And do you protect the pages to avoid smudging? Linda thank you so much for your lovely comment. I don’t use oil pastels too often but they are wonderful for being out sketching because they are so immediate and allow me to lay down colour quickly without the messiness of paint. Those sketches were just created in a sketchbook with normal drawing paper – not too thin. And I have not noticed the oil coming through – although I have used the oil pastels on both sides of the paper. I have to admit though I am not too precious about my sketchbooks and would not mind if they did. I do spray them with the Sennelier oil pastel fixative and put glassine paper between the pages as with the fixative they still remain a little bit stick. No gesso or anything though – just the pastels laid down on bare paper! I hope that helps!